Wine, glorious wine. It doesn’t really need a companion, but if it’s teamed with good food, picturesque scenery and maybe even an open fire, it is actually possible that we can fall deeper in love with those little fermented grapes after all. So, if you call yourself a wine enthusiast and a weekend escape has been on your agenda, the Hunter Valley should be a priority destination. With over 150 wineries in the region, you certainly won’t be spoilt for choice, but the question is, how on earth will you decide where to visit? Aaah, first world problems strike again! Well, you can thank us later because we’ve done the ‘hard’ work for you. For hot tips on where to go during your trip to the Hunter Valley, we’ve got you covered. From accommodation to vineyards, we’ve even thrown in a brewery, transport options and tasting tours—because we know you’re better suited to drinking and eating the best of what the Hunter has to offer, rather than trying to figure out where to. 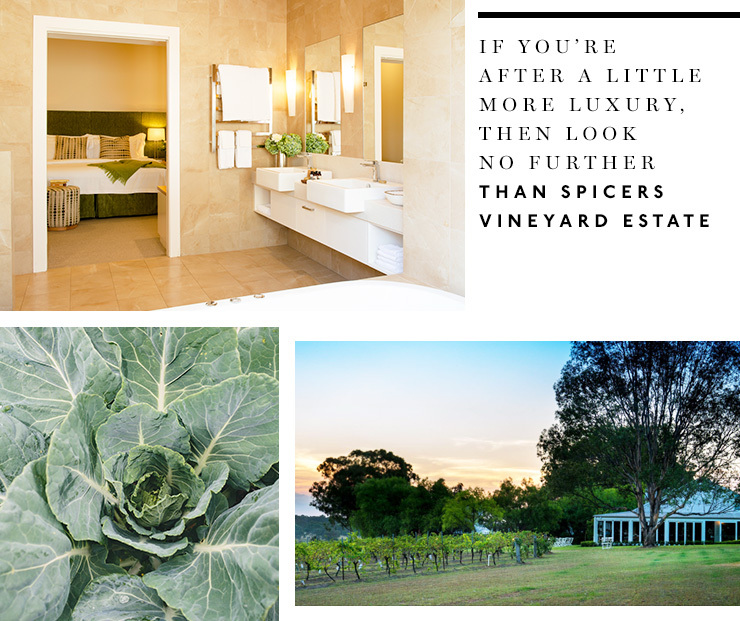 If you’re after a little more luxury, then look no further than Spicers Vineyard Estate. They have two accommodation options, King Spa Rooms or Luxury Spa Suites, either way, you’re in for a treat here. The guest rooms are nestled between the estate’s private vineyard and natural bushland, providing complete serenity. Each room is complete with an ensuite spa and wood fire. The rooms open out onto large private verandas, courtyards or balconies that offer a superb view over the vineyard. For extra R&R, you can also choose from a range of spa treatments, so after a day of touring the region and potentially a little over consumption, this is the perfect way to prepare yourself to head back to the big smoke. If you’re coming with a big group, then this is the perfect place as Cicada and Hunter Moon are two luxury holiday houses situated right next door to each other. With the capacity to sleep 8-24 people, depending on your group size you can book out one house or two. Both houses are positioned in an idyllic setting at the foothills of the Broke Fordwich mountains, offering an incredible panoramic view from any one of the two hot tubs(!). A convenient five-minute drive into Broke and only a short distance to surrounding Hunter Valley vineyards, Cicada and Hunter Moon are your home away from home. If you’re looking for something a little more romantic, Cedar Creek Cottages in Wollombi are ideal for couples. Set amongst lush greenery on the Stonehurst Estate, these cosy, self-contained cottages boast country living with wood fires, spa baths and a private veranda. For those planning on a weekend of pure indulgence, complimentary decanters of port and chocolates are left in each room along with a country breakfast hamper for the mornings. Guests also receive a discount at the Stonehurst organic cellar door, so if you don’t make it off the Stonehurst vineyard during your stay, you’re probably not the first. For those who ‘have an appreciation for the finer things in life’, the cellar door at Tempus Two is worth the visit. 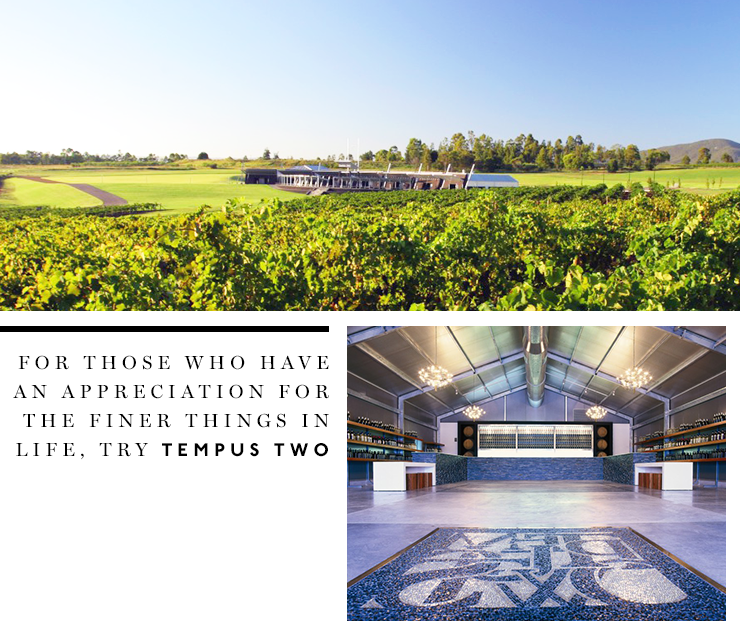 A striking attraction, the Tempus Two cellar door represents a unique and modern wine tasting experience set on the Roche Estate—a lovely expanse of greenery that houses concerts during the warmer months. Private and group tastings can be arranged and walk-ins are also catered to for smaller crowds. Not your average wine tour haunt, Matilda Bay is a brewery for those who need to take a break from fermented grapes for a little while. Hidden in the fields of the Hunter Valley, overlooking rolling vineyards, this is the perfect place to enjoy a good, frosty brew. You can try the whole range with a tasting paddle or, for those who still want to be a little bit fancy, you can get cocktails here too! There are 12 craft brews on tap and a great pub like menu for the hungry. If you’re looking for good tunes and anything but wine for a while, this is your place. Not to be missed when visiting the Hunter Valley. Audrey Wilkinson cellar door is perched atop a hill overlooking the valley with the picturesque Brokenback Mountain Ranges providing a flawless backdrop for your wine tasting experience. You can even come here prepared with a picnic, grab a bottle or two from the cellar and set yourself up on a grassy knoll overlooking the vineyards. Now that’s what we call pure bliss. If you’re looking to learn something more about the history of wine making as you sip award winning wines, Tyrrell’s is the place. You can see the old oak vats and red cellar in full operation and the original bark hut once occupied by Edward Tyrrell himself still remains at the location. If you plan on popping by Tyrrell’s, make sure you book a tour or tasting in advance as this one can get busy! In the heart of the Hunter Valley wine country is Bimbadgen, a remarkable winery and vineyard encompassing a cellar door, restaurant, café and outdoor amphitheatre. The tastings themselves are conducted with a modern approach and offer a stunning view over vines that produce the range of wines available. Group and private tours can be booked in advance and, if time permits, it’s certainly worth sticking around for a bite of fresh local produce with a spectacular outlook. One of the Hunter’s boutique wineries, this lavish space will have you transported to Spain or Tuscany, with its European design, Spanish floor tiles, ironbark beams, concrete pillars and a private courtyard equipped with soft flowing fountains. Iron Gate Estate pride themselves on taking a hand crafted approach to wine-making and this is reflected in their offering of unique wines produced from the grapes handpicked at the vineyard including sauvignon, shiraz and some exotic offerings like sweet shiraz and chardonnay. Set on the Spicers Estate, the menu at Restaurant Botanica focuses on seasonal freshness, with many of the kitchen’s herbs and vegetables coming direct from their own garden. The dishes are of course complemented by an award winning wine list from Spicers Estate winery with suggestions of wine matching for each dish available. Make sure you leave room for dessert here though, as the strawberry meringue or the pear with custard and caramel ice cream are not to be missed! This modern restaurant in the Hunter Valley is well worth the stomach space. Located within Oakdale Winery, this small but impressive restaurant is the brainchild of Frank Fawkner, who is creating some truly unique dishes which could sit comfortably on any inner city menu. The tasting menu is definitely the way to go where you can choose from five or eight courses, with or without matching wines. As expected, there is a focus on local produce and the menu changes seasonally depending on what they can get their hands on. If you love cheese, then don’t be turned off by the name of this place. 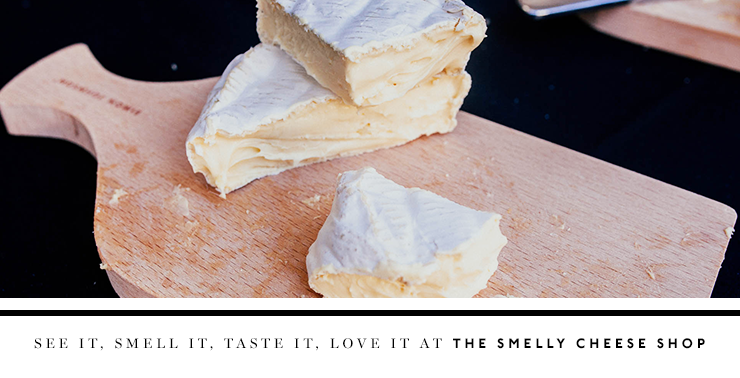 The Smelly Cheese Shop is made for cheese aficionados, with an impressive list of local and imported cheeses as well as gourmet foods including oils, chutneys, biscuits and spices. Only a few doors down from Tempus Two, on the Roche Estate, The Smelly Cheese shop is also the perfect lunch destination in between wine tasting. With things like pizza, burgers, sandwiches and even gelato on the menu, there is something here for everyone. Margan boasts a state of the art winery and stunning cellar door, but if you’re in need of a good meal, this is where it’s at. There’s a one-acre kitchen garden where 90% of the fruit and vegetables used for the seasonally inspired menus are sourced. Additionally, the estate also homes free range chickens, Black Suffolk lambs, bee hives for fresh honey and olive groves for the table olives. This is literally like a one stop shop set amongst stunning surrounds of the Broke Fordwich wine sub region. Okay, so with all the wine tasting, we don’t blame you for craving some good old fashioned carbs, but don’t go filling up on too many crackers and cheese. Il Cacciatore Italian restaurant is worth holding out for, for some real authentic Italian fare. Think four cheese gnocchi, duck ragu and roasted butternut and pumpkin risotto that ought to hit the spot. If you’re after something a little lighter, the Italian cheese platter of taleggio, parmigiano, pecorino and gorgonzola dolce de latte served with fig paste and house made lavosh is perfect to team with a pre or post dinner drink—which can be enjoyed from the comfort of the plush lounge, next to the open fire. Our idea of heaven. We totally get it. Sometimes you just don’t want to leave the comfort of your accommodation to venture out for a feed and, luckily for us, Eden Catering gets it to. This personal chef service will come to you! Eden Catering is a unique catering service that is tailored to your event and budget using only fresh, quality ingredients. Whether it be intimate meals or a small group gathering, they’ll provide everything you require, from cutlery and plates through to linen and table decorations. There will even be wait staff on hand to serve you and your guests in your home or preferred location so you can sit back and relax. This wine tour offers cheese and wine experiences depending on your time restraints. You can choose to do an hour or a half day tour with VIP tastings or a full day tour with lunch and includes chocolate, cheese and even a visit to a brewery. A hop on and hop off bus service where you can choose your own adventure and stop and stay on for as long as you like. For those who’d prefer to indulge in some spa time during the day, iHop also offers a tour of the wine region by night which includes a seven course matched cheese and wine tasting followed by a two course tapas style dinner. Your exclusive private tour for being chauffeured in style. Hunter Private Tours tends to focus on smaller boutique wineries. Each tour is unique and tailor made for your personal tasting experience, so just let them know what it is you’d like to experience and they will be sure to cover it during your trip. If you’re coming with a crowd, you can hire a bus to transport you around the Hunter Valley. Full and half day services are available in a 6, 13 or 20 seat vehicle. Each group is welcome to put together their own itinerary but they also offer 4, 5, 6 and 8-hour tour packages to save you having to do your research. The Hunter Valley is only two hours from Sydney’s CBD, but if you’re not up for the drive, there are alternative transport options, so you can sit back and relax and have your camera at the ready for all the scenic tourist shots on the way. If you’d like to travel by coach, there are multiple options picking up and dropping off from Sydney. Daily train services run from Central Station to Maitland, Newcastle or Singleton. Connecting buses can help get you to and from your accommodation. Cessnock airport is the closest airport for those of you planning on arriving via private charter or helicopter (chuff). For the rest of us, Newcastle airport is one hour from the Hunter Valley and you can hire a car from there. Head to Visit NSW for more travel inspo. Image credit: Audrey Wilkinson, Spicers Retreats, Tempus Two, Ariania Grille, Yaserra Moosea.